2017 Ford Escape For Sale In Vernon, Kelowna, Okanagan, BC. Designed to meet your needs, the ﻿﻿﻿﻿﻿2017 Ford Escape﻿﻿﻿﻿﻿ offers versatility, style and comfort for busy drivers and active families. A four-door SUV, this model comes with multiple options to enhance the driving experience. Three trim levels offer various features to capture your attention: S, SE and Titanium. New wheel options and available HID headlights are just some of the changes in the updated design for the 2017 Ford Escape. A sculpted hood catches your eye from the front while LED taillights leave a lasting impression from the rear. The grille has taken on a more aggressive appearance to create a memorable profile that looks good even when standing still. A new Sport Appearance Package enhances the athletic image of this SUV with features such as black bezel halogen projector headlamps and black tinted taillights. The package also includes a black painted upper grille and black front fender grilles along with black fog light bezels. Nine colour choices ensure one fits your personality with shades like Lightning Blue, Ruby Red and Shadow Black. An available roof rack offers additional storage to increase the versatility of this SUV. 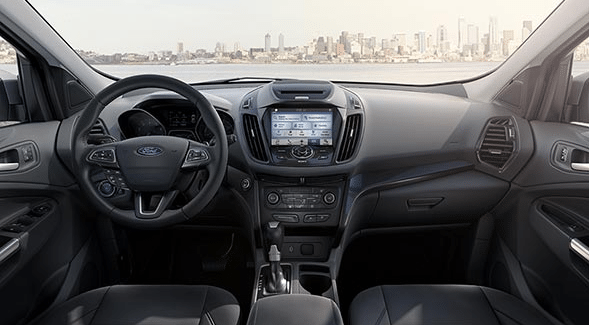 The cabin of the 2017 Ford Escape is all about comfort and convenience with a focus on the driver. An updated centre console provides easy-access storage for important items while containing a media hub to charge portable devices. Choices of cloth or leather upholstery allow you to customize the interior to fit your style. Part of the updated design is a new three-spoke steering wheel which contains audio controls and other settings. The instrument panel has also be redesigned with a USB port to make it easier to connect portable devices along with a pocket for storing those gadgets where you can find them once you reach your destination. Available heated seats provide warmth on those cold Canadian winter days while the Titanium includes 10-way power seats and a heated steering wheel. Split folding rear seats give you more room for hauling longer cargo items while still carrying passengers. With both seats folded down, you enjoy 1925 litres of space. An electric parking brake takes up less space in the cabin and makes it easy to set the brake with just a touch of a button. Advanced technology provides for better control and more fun with features like the available foot-activated power liftgate where you can just wave your foot under the sensor when your arms are full. SiriusXM satellite radio and Bluetooth connectivity expand your entertainment options and keep you in touch with friends and family with hands-free access. SYNC 3 is an updated version of the multimedia centre with more user-friendly control, such as improved voice commands. Available SYNC Connect allows you to control your SUV from your smartphone. Use this system to lock or unlock doors, to start your vehicle remotely and even locate it in a parking lot. Modern technology provides for safety with systems designed to assist with driving, such as BLIS with cross traffic alert and adaptive cruise control. Stay in your lane with lane keep assist while active park assist helps you back into parking spaces with ease. Turn the 2017 Ford Escape into your dream vehicle with the latest accessories. Whether you’re looking to enhance capability, versatility or style, you’ll find numerous options designed specifically for your model. Protect your vehicle with all-weather floor mats or a hood protector. Stay organized with the soft folding cargo organizer while a cargo security shade hides your items from view. Seat covers reduce wearing on the upholstery while the remote start system offers practical convenience, especially in the winter. These are just a few of the options available for this SUV. 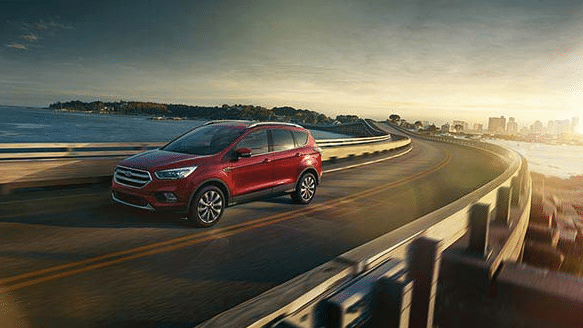 Enjoy a perfect blend of power and efficiency with the 2017 Ford Escape. All three options are four-cylinder for added fuel economy while providing the right kind of performance. Paired with the six-speed SelectShift automatic transmission, you experience a quick response and smooth handling. While front-wheel drive is standard, all-wheel drive is an available option to meet the demands of adverse road conditions. Tow a trailer for added versatility with the Class II Trailer Tow Package for a towing capacity of up to 1587 kg with the 2.0L EcoBoost engine. Enjoy enhanced value with the 2017 Ford Escape. Trust the Ford warranty for the 2017 Ford Escape to give you peace of mind. Enjoy all the 2017 Ford Escape has to offer in its redesign. No matter whether you’re looking for comfort, convenience, style or safety, this SUV has it all. 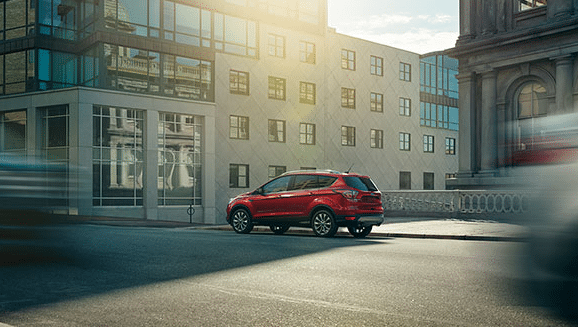 Check out a Ford model that delivers the best in performance, efficiency and fun with the Escape. Test drive the 2017 Ford Escape at your local Vernon Ford Dealer – Watkin Motors Ford. Take it out on the highway to see how well it performs while wielding your way through city traffic with ease. Trust Watkin Motors Ford to have the perfect Ford model for your needs.